Whenever an agenda is scored or stolen, do 1 net damage. When You Need the Human Touch. When first drawn to red corp, players will almost always see the potential to flatline the runner through net damage as the primary method for winning. In reality, though it took some time for (some) players to realize this, net damage fills the design space more as a tax or an additional cost most runner decks are not ready to deal with. It removes cards from the runner’s ability to play them, and even with heavy recursion it can still take out very important cards. Imagine Levy AR Lab Access being hit for net damage in a MaxX: Maximum Punk Rock deck, for instance. Net damage is far more prevalent than meat or brain damage, and often easier to deal out than the other two varieties, but is almost always found in smaller chunks. Individually it is often easy to recover from one or two sources of net damage and keep going, but the threat of it is always there. For Personal Evolution, often called Black Tree, the tax is always present. Black Tree relies on pressuring the runner into making runs they don’t want to do, but has no choice, leading right into a nasty trap. Even though it was just written that net damage is mostly a tax, the threat of Flatline is often used as a way to force the runner to make a mistake. 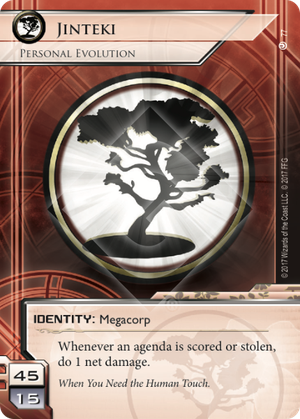 Black Tree developed slowly in the meta, not really having the economy in faction to make it effective at being able to threaten agendas when it needed to. Economy arrived for them, released in Honor and Profit (and before) that has really seen all forms of Jinteki reach high positions in major tournaments across the globe. Black Tree decks are often designed for the kill to be a happy coincidence, but not the main focus. Built more around around taxing through both credits and discards, forcing the runner to rely on less and less tools or use up some of their tools (such as Clone Chip ) when they didn’t quite want to. Now that the economy has caught up with other corp factions, Black Tree remains a potent force, and will continue to do so.